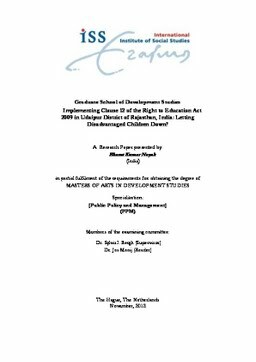 Erasmus University Thesis Repository: Implementing Clause 12 of the Right to Education Act 2009 in Udaipur District of Rajasthan, India: Letting Disadvantaged Children Down? Implementing Clause 12 of the Right to Education Act 2009 in Udaipur District of Rajasthan, India: Letting Disadvantaged Children Down? The Implementation of Clause 12 of The Right of Children to Free and Compulsory Education Act 2009 (RtE) in Udaipur District of Rajasthan, India Clause 12 makes it obligatory for private schools to provide 25% free admission to children from disadvantaged and weaker sections of society in class 1st to 8th. The government will reimburse the expenses in this regard to private school on the basis of per per-child-expenditure in public school. I have analysed through two different theories; one using principles of rights- based approach; availability, accessibility, adoptability and acceptability to identify the gaps between policy and practices and the other using street-level bureaucracies theory to explain the implementation of the Clause. Clause 12 aimed to bridge the inequality in society while providing opportunities to disadvantaged children to get quality education which was hitherto accessible only to the economically privileged strata of society. As a result of improper implementation, unclear provisions of RtE among government authorities, lack of awareness among target community and existing Caste discrimination it has not succeeded in achieving its aim. Specifically, the findings show that private schools have devised varied methods to officially follow the clause 12 and while unofficially getting around their obligation to provide admission to the disadvantaged children. In rural areas, low budget schools tried to make illegitimate profit while charging fee from parents and also claiming from government, whereas some urban high budget schools segregate these children from upper strata children. Theory of street-level used for analyse the discretion use by bureaucrats which shaped by surrounding social, political and organisational environment where they work.